Last week’s critique of Rick Hess’ and Mike Petrilli’s Washington Post piece decrying “achievement gap mania” and its alleged impacts on top-performing students certainly garnered some responses. Many agreed with my arguments, while others accused me of being irresponsible for possibly suggesting (although I haven’t done so) that there are no trade-offs for focusing on improving education for at-risk students (including those who actually may be deserving of being called “gifted and talented”, but are struggling with literacy) over those Hess and Petrilli considered to be the “ablest”. This isn’t shocking. After all, one of the problems in the battle over reforming American public education is that both education traditionalists and many reformers take a deficit approach to solving the nation’s education crisis, arguing that focusing on one solution is feasible. This thinking, based in part on a misinterpretation of economic and political theories, is off-target because the nation’s education crisis is so complex that the overhaul will require myriad solutions. Certainly one can’t provide the same level of resources to all solutions. But, as I pointed out in last week’s Dropout Nation Podcast, solving the crisis must be done in a holistic way that recognizes the interconnectedness of both problems and solutions. Focusing on stemming achievement gaps is the most-sensible way addressing the crisis. Why, for one, it is the approach that will lead to the proverbial tide that raises all boats, especially since the problems of low-quality instruction and curricula are not limited to the millions of children — including the 33 percent of fourth-graders — who are likely to drop out in the next eight years. As I pointed out last week, even students who are doing well in school are denied all that they need for their success. Rationing high-quality education and damning some kids to low expectations, as Hess and Petrilli, are suggesting, just won’t work. Boser’s point hits upon the reality that the ability of kids to get the rigorous, college-preparatory curricula they often depends on they are perceived by the teachers and guidance counselors who serve as gatekeepers for such programs (along with the relationships their parents have with the gatekeepers). As a result, far too many kids — especially kids who never get the chance to exercise their academic potential. As former National Math and Science Initiative president Tom Luce noted earlier this year, even with the growth in students taking A.P. courses, far too many black and Latino students are shied away from them. This happens despite the fact that A.P. participation increases their likelihood of kids graduating from high school and completing college. In Atlanta, for example, just 7 percent of black students were taking AP courses during the 2005-2006 school year, while 31 percent of their white high school peers took those courses. In Loudoun County, Virginia, a mere 14 percent of black students took AP courses, versus 31 percent of their white peers. 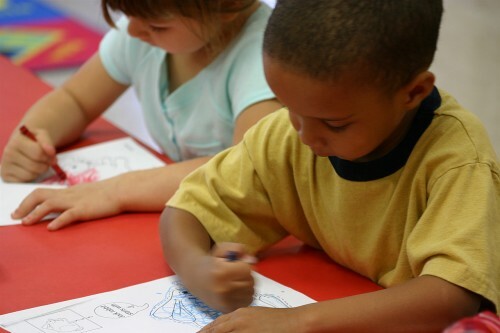 As with gifted-and-talented programs in the early grades, poor and minority kids are often denied these opportunities, forcing those parents who are aware of them to fight hard against district bureaucracies that insist that only some kids can learn. This gatekeeper problem is especially pernicious given that we really don’t know if a five-year-old “gifted and talented” student would actually qualify as being gifted and talented down the road — or even at that period of time, depending on the test. This can be seen in the efforts by parents to prep their kids for IQ tests used for admission by some private schools for their own gifted-and-talented programs. As University of Iowa psychologist David Lohman and Katrina Korb (now of the University of Jos in Nigeria) pointed out in a 2006 report, just 45 percent of first-graders who scored higher than 130 points on the Stanford-Binet test used by many to determine cognitive ability would have scored at that level on other IQ exams; most first-graders considered gifted in first grade don’t keep that label two years later. And, according to Lohman, only 25 percent of four year-olds scoring 130 on the Stanford-Binet will do so as 17-year-olds. The fact that cognitive ability is dynamic and not a constant is certainly one reason why so many students labeled “gifted and talented” don’t necessarily stay that way. Especially for children in the preschool and early elementary grade levels, cognitive ability is as much influenced by the quality of learning environment (especially in school) as it is on natural growth over time. The fact that talent is as much forged by challenge (academically and otherwise) as it is by any innate ability is also part of the reason; after all, it explains why so many once-struggling students such as Fedex Office founder Paul Orfalea (a dyslexic) turn out to be successful (one would say, far more more successful) than the A-students who did well in the classroom. Ultimately, it is far more important to provide all children with high-quality education and help all of them address their particular learning needs — from reading remediation to providing them with additional outside learning opportunities — than to segment and label based on labile abilities. But in any case, the fact that so many students considered top-performing in the early grades don’t stay that way leads to these three conclusions. The first: That gifted-and-talented courses are not even close to the high quality that Hess and Petrilli proclaim them to be. The study conducted by the Northwest Evaluation Association on behalf of Fordham hints to that possibility; while the recent study co-authored by Sai Bui, Steven Craig and Scott Imberman this past October in Education Next report clearly points to that fact. Considering that most school districts aren’t using Value-Added analysis of student test data in evaluating teachers and identifying their most-talented instructors, there is no way that gifted and talented programs can be cordons solitaire from the low quality of teaching and curricula endemic throughout American public education. And, as the Jack Kent Cook Foundation pointed out in its 2007 report, this state of affairs is especially true in massive urban, suburban, and rural dropout factories. The second: If we are going to continue the existence of gifted and talented regimens (outside of those of specialized high schools such as New York City’s Stuyvesant High School, which solely use test score results and grades for selecting pupils), there shouldn’t be any gatekeeping over them. The wide swings in the cognitive development of those who would actually be considered “ablest”, along with their own subjective biases, renders the judgement of teachers and guidance counselors too unreliable for the gate-keeping role. Instead, parents should either be able to place their kids into the programs and let the children sink-or-swim based on their performance, or admit students into gifted-and-talented courses based on test score growth over time. And finally, it’s time to toss the concept of gifted and talented into history’s ashbin. The continued existence of this program, along with special education ghettos, perpetuate one of the underlying culprits of the nation’s education crisis: Ability tracking, or the concept of rationing high-quality teaching and college preparatory curricula based on racialist and condescending early-20th century views that only some kids (namely those from white middle-class households) are capable of mastery. More importantly, they have proven to be ineffective in helping those identified as gifted stay that way over time. What should be done instead is to provide all children with the high-quality teaching and rigorous college preparatory curricula they need for lifelong success. Doing so still allows for providing intensive reading remediation to those kids struggling in literacy and numeracy, and helping those already performing ahead of their current grade attain the challenging teaching and curricula they need to build mastery. This starts by moving away from the traditional approach of keeping kids in the same grade for a full school year, even when they have proven able to move forward into the next grade. The New York City Department of Education’s School of One initiative has already shown the benefits of allowing kids to move on to the next grade so they can get the challenging curricula they need to build mastery. Another step lies with expanding school choice. As I note in this week’s Dropout Nation Podcast, expanding school options allows families to actively shape their children’s learning, expanding learning opportunities for all kids regardless of who they are or where they may live. Enacting Common Core state standards in reading and math, along with improving on those standards and building high-quality curricula around them is also critical to this approach. And finally, we must continue to overhaul how we recruit, train, evaluate, and reward teachers. That last step will allow for all kids, regardless of their talent level, to get the high-quality teaching they need for lifelong success. It is time to move away from deficit thinking on solving the education crisis and recognize the fact that improving teaching and curricula for the students most ill-served by failed traditional public schools practices will also those students who are only slightly-better served by them. It’s not just about at-risk students or top-performing kids. It is about providing all of them the schooling they deserve.